At St John of God Health Care, research is fundamental to our goal to be recognised as a leader in the Australian health sector for the provision of high quality health care. As part of a five year strategic focus (2015 -2019), St John of God Health Care aims to increase high quality research that delivers innovation and translates into improvements in health outcomes for our patients. To achieve this, we are committed to collaborative research with experts and pioneers in their field from academia, industry and clinical practice to inform the delivery of best practice health care using new protocols, technology and products that improve health outcomes. 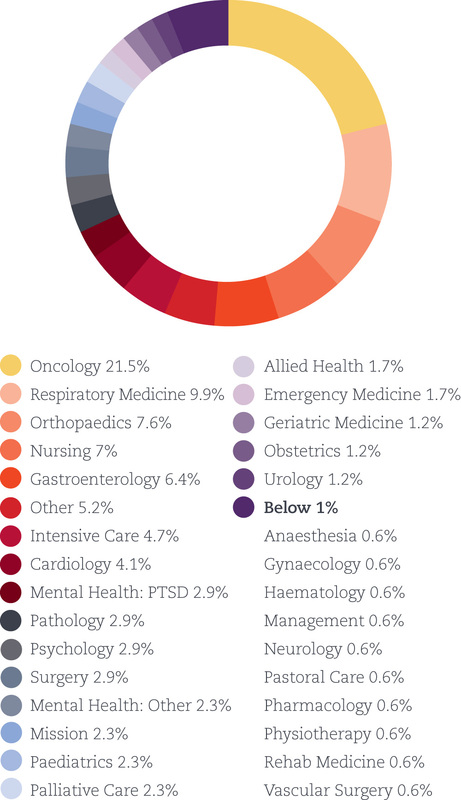 We engage in collaborative multicentre research among our own hospitals (56%) and with other organisations within Australia and overseas (44%). Our research governance processes and ethics submission processes are continually refined to ensure the timely start-up of quality research projects. 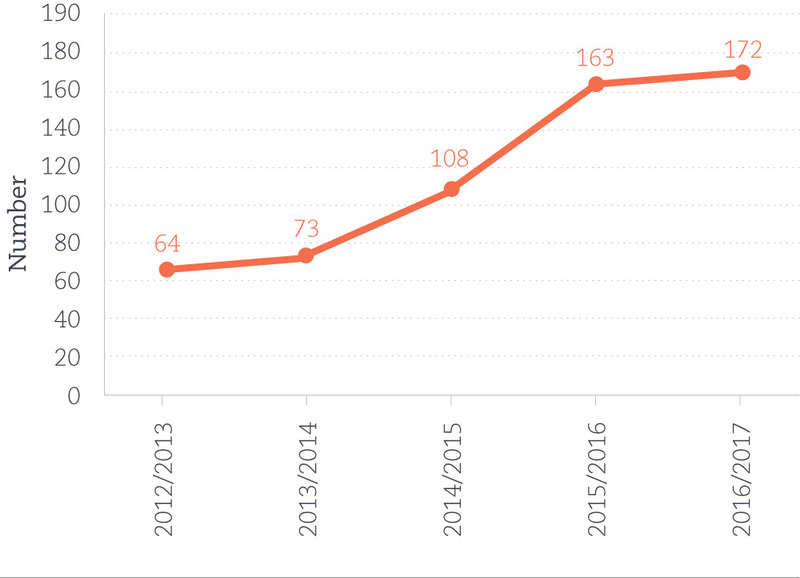 A total of 172 research studies were approved in 2016-17, ranging from smaller quality improvement and evaluation projects through to larger clinical trials of new medications, devices and therapies. In 2014, St John of God Health Care approved 73 research projects. This means we have already exceeded the goal we set in Our Strategic Priorities 2015-2019 to double the volume of research. Most of the research is in oncology (22%) covering various cancers, including breast, gynaecological, lung, skin, upper GI, and urological. Other strong areas of research include respiratory medicine, orthopaedics, nursing and gastroenterology. St John of God Health Care seeks to be involved in clinical registries, where the collection of clinical data can be used to monitor care outcomes and improve health care practice and policy. During the year, we participated in three new registries, including National Echo Database Australia (NEDA), Australian Spine Registry Pilot and the Victorian Cardiac Rehabilitation Registry Project. 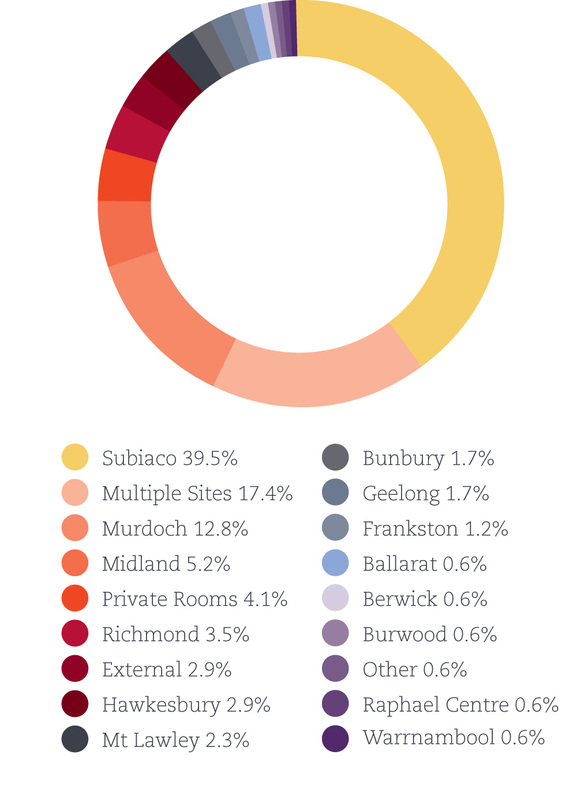 In 2016-17 most of the research (40%) was conducted at St John of God Subiaco Hospital. St John of God Subiaco Hospital appointed two new research fellows, Dr Ciara Daly working in oncology and Dr Phil Craven working in respiratory medicine. St John of God Subiaco Hospital established a research management committee, chaired by Director Clinical Trials, Steve Webb, to grow and integrate research into all aspects of the hospital. St John of God Murdoch Hospital appointed a Research Operations Manager, Dr Steve Edmondston. St John of God Midland Public and Private Hospitals’ Central Sterile Services Department Manager, Lee-Ann Spencer, was appointed a Member of the Federal Sterilizing Research Advisory Councils of Australia. The nursing research studies commenced throughout the year have focused on ongoing skills development and resilience in the workplace. There were also new research studies examining patient experiences and specific patient management issues relating to cognitive impairment and cancer. Many of these studies are being undertaken by St John of God Health Care nursing caregivers - for some as part of their postgraduate studies (Masters and PhD degrees) and for others the research is being conducted in collaboration with local universities. For example, one of our nursing caregivers at St John of God Subiaco Hospital is examining resilience of nurses as part of her PhD research. It is expected that the findings of this study will contribute to establishing how the values of an organisation can foster resilience in nurses, and in turn support the retention of nurses within the organisation. Another study, led by a nursing caregiver at St John of God Murdoch Hospital, aims to determine the incidence of falls and the development of pressure injuries in patients with cognitive impairment. Symptom burden among patients admitted to a Specialist Palliative Care Unit for end of life care: a Western Australian PCOC study. Improving Whole Person Care: A mixed-method study which explores the role of the enrolled nurse within a team nursing model from the perspective of enrolled and registered nurses. A cross-sectional study to establish: the supportive care and health literacy needs of cancer patients undergoing chemotherapy treatment in a private cancer centre (cancer survivorship); the experiences and needs of family carers, patients and health care professionals across Western Australian palliative care services; and gaps in service delivery. Building a research culture in pastoral services is important to determining the effect of caring for a person’s emotional, spiritual and religious needs on improving their wellbeing and personal outcomes. In 2016-17, a paper from St John of God Murdoch Hospital entitled ‘How patients experience pastoral care in a tertiary hospital setting’ was published in the Journal of Pastoral Care & Counseling, and St John of God Burwood submitted a paper to the Health and Social Care Chaplaincy Journal entitled ‘Patients experience of pastoral care in a mental health hospital’. In addition to this, St John of God Pinelodge Clinic has been conducting research to evaluate the group-based pastoral care program and expects to publish its findings in 2017-18. St John of God Bendigo Hospital has been undertaking research on ‘What Spirituality Means for People in Acute Health Care’ as part of a larger study to develop and test an Australian model of evaluating the value of spiritual care for consumers, and has also undertaken a study of music therapy in a pastoral context. At a group level, St John of God Health Care is undertaking a project across five sites – St John of God Pinelodge Clinic and St John of God Berwick, Bendigo, Frankston Rehabilitation and Murdoch Hospitals – to study the emotional and spiritual domains of whole person care, using a two-part mixed methods (qualitative and quantitative) research methodology. St John of God Subiaco Hospital is one of the most active hospitals in research, among both public and private hospitals in Western Australia. Its vision is to be an academic hospital that provides the highest quality patient care, while conducting and integrating effective and efficient research. Research Management Committee established comprising hospital executives and several lead investigators, and Professor Steve Webb nominated as the inaugural chair. The committee provides research leadership and ensures the management of research funds and delivery of quality patient care is in accordance with the Mission, philosophy and Values of St John of God Health Care. The recently established Inflammatory Bowel Disease (IBD) Unit, led by Professor Ian Lawrance, now has four key projects underway, as well as involvement in eight international clinical trials. An IBD fellow has been appointed, the first in the private sector. The WA Thoracic Research Group was established this year from funds donated by the Bendat family. The group is led by renowned Respiratory Physician, Professor Eli Gabbay whose two main focus areas for the group is the WATRG Biospecimen Bank, which involves the collection and storage of donated specimens for future use in research, and ongoing research projects to improve patient care and outcomes in the respiratory and oncology fields. Two fellows were appointed to support the group. The Anaesthesia and Pain Unit continued to be the top recruiting site in the world for the PADDI study and top recruiting site in Australia for BALANCED trial. The hospital received funding to open a Breast Cancer Survivorship Clinic to help patients treated for breast cancer. It assists patients who are within one year post-chemotherapy and/or radiotherapy treatment and includes free wellness programs to help patients thrive. Director Gynaecological Cancer Research Group, Dr Paul Cohen is the principal investigator for an international multicentre prospective randomised pilot study to compare excisional treatments for adenocarcinoma-in-situ of the uterine cervix. The Australia and New Zealand Gynaecological Oncology Group have funded this trial. St John of God Subiaco Hospital has joined over 30 sites around the country, together with BioGrid Australia, to collect data on the presentation and disease course of metastatic colorectal cancer, surgical interventions for primary and metastatic disease, and prescription of systemic therapies, including how they are combined with biological drugs. This has provided much needed information regarding the multidisciplinary management and outcomes of this disease in routine clinical practice. The Colorectal Cancer Research Group have successfully established laboratory methods for identifying multiple types of cells in the same tissue section. This allows the group to conduct further cutting-edge research into the immune response to colorectal cancer. The image entitled ‘The World of Tumour Immunology’ (below), which showcases this technique, won first prize in the 2017 Australasian Society of Immunology ‘Snapshots of the immune system’ national scientific photography competition. Within orthopaedics, the first MAKO total knee replacement was performed in December 2016 and by the end of June 2017, 120 patients had received a total knee replacement using the Stryker MAKO robotic surgical arm. The MAKO Registry, which captures outcome data relating to knee replacements, is expected to be complete by 2018. Currently 125 patients have undergone partial knee replacements in this registry. A number of clinical trial safety and compliance initiatives have been implemented that focus on training and teaching, including research investigator-initiated research study safety and risk mitigation programs, pre-audit programs, internationally accredited transcelerate Good Clinical Practice (GCP) and research ethics on-site training. 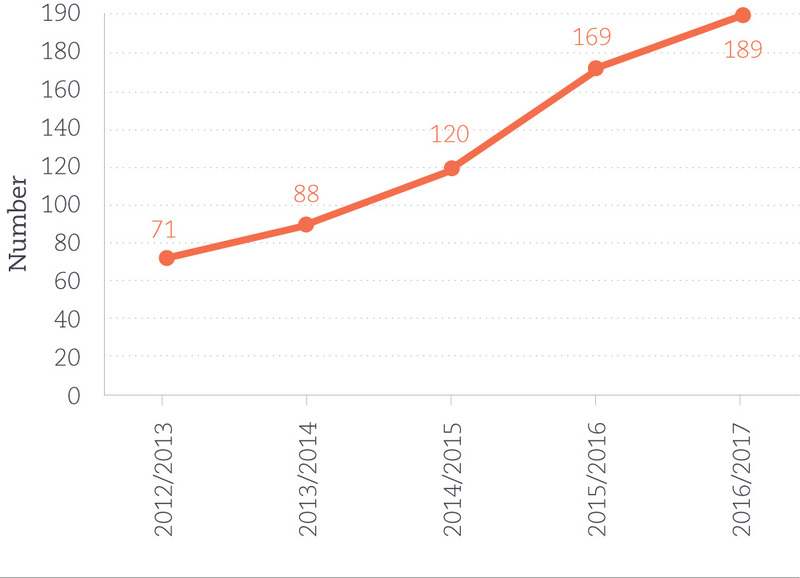 2016-17 has seen significant growth in research at St John of God Murdoch Hospital, reflecting the capacity of the hospital to support research, and the motivation of the principal investigators to incorporate research into their clinical practice. There has been significant growth in Oncology Clinical Trials, which support access to innovative treatments for some of the most common cancers. Current trials of immunotherapy and gene-directed therapies are delivering impressive results. Clinical trials promote important industry partnerships, and these collaborations are growing as the Murdoch Oncology Clinical Trials Unit has built a strong reputation for conducting high quality research. Two orthopaedic research officers were appointed to support ten clinical trials. The focus of research is on patient-centred management and innovative approaches to evaluating patient outcomes. Professor Piers Yates was awarded the Johnson & Johnson Orthopaedic Fellowship to support orthopaedic surgery training and research. The Intensive Care research group is hosting a number of multicentre clinical trials examining management of key clinical issues including patient nutrition, septic shock, oxygen therapy and early mobilisation. A sponsored cardiology clinical trial commenced to evaluate a new left atrial implant designed to reduce the risk of thromboembolism in patients with atrial fibrillation. The emergency medicine research team is initiating and collaborating in clinical trials in pain management and pre-hospital care. The team completed the CTPAINED study, which assists in developing a national standard for the use of CT pulmonary angiography in emergency departments. St John of God Burwood Hospital retains a strong focus on perinatal mental health research and clinical excellence through its Perinatal Women’s Mental Health Unit under Prof Marie-Paule Austin, Chair of Perinatal and Women’s Health. In 2016-17, Professor Austin and her team co-authored four peer-reviewed publications and presented the findings at the International Marcé Society Conference in Melbourne in October 2016. Completion of the first Australian study to report on post-discharge clinical and parenting outcomes for women admitted to the Mother and Baby Unit. Continued leadership of the Perinatal Integrated Psychosocial Assessment (PIPA) project, in partnership with NSW Health. Results will inform maternity services’ planning and guide efforts to maximise health system efficiency and sustainability. Continued leadership of a national “big data” perinatal project, funded by the National Health and Medical Research Council, examining the impact of the 2009 National Perinatal Initiative. Results from this landmark research were cited in the ‘100 Positive Policies’ Policy Agenda in August 2016. In addition, national data items for psychosocial assessment during pregnancy developed as core component of this project have been included in an agreed set of priority data items for improving national data collection (Australian Institute of Health and Welfare 2016). St John of God Health Care, in partnership with the University of New South Wales and the Black Dog Institute, established a five year program of trauma and mental health clinical research (2014-2018). The foundation Professorial Chair of Trauma and Mental Health, Prof Zachary Steel, based at St John of God Richmond Hospital, was appointed in March 2014. He has been joined by a group of leading researchers including Dr David Berle, Dr Simon Rosenbaum, Dusan Hadzi-Pavlovic and Ruth Wells. Since commencement, the Trauma and Mental Group have published more than 70 peer-reviewed research outputs, co-published new national guidelines for the management of post traumatic stress disorder among emergency service workers and presented at more than 50 international and national conferences and symposia. The group have attracted $3.8 million in research funding since 2014 and are supporting a wide range of research projects in Australia and internationally, including among mothers and children in Timor-Leste and displaced Syrian refugees in Jordan. During 2016-17, Dr Simon Rosenbaum and Dr David Berle were successful in obtaining competitive National Health and Medical Research Council Research Fellowships, with Dr Rosenbaum also being awarded a prestigious University of New South Wales Scientia Fellowship. Within Richmond Hospital, the group supported Kirrily Gould to complete an open trial of the benefits of targeted exercise in helping patients with Alcohol Use Disorder manage the impact of cravings, which has established this as an effective alternative to medication. Andrew Chen has commenced a project examining the association between post traumatic stress disorder, measures of fitness and daily functioning, which will help extend a strong program of research into the role of physical activity in improving mental health. A focus of the group’s research program is also an investigation into the processes of change that occur for individuals attending the St John of God Richmond Hospital post traumatic stress disorder recovery program. This complements a broader program of research into the nature of psychological trauma that aims to improve treatments and outcomes for individuals experiencing this disorder. ‘The Impact and Effectiveness of the Creative Arts Project at St John of God Mt Lawley Hospital’, at the 2016 International Congress on Innovation in Nursing. ‘Singing with your Baby: a feasible, acceptable and effective addition to the Burwood Mother and Baby Unit’, at the 2016 International Marcé Society Conference and the 2016 International Arts and Health Conference. ‘Viva Voices: The impact and effectiveness of participatory music workshops at St John of God Frankston Rehabilitation Hospital’, at the 2016 Australian Rehabilitation Nurses Conference. Based on recommendations from St John of God Mt Lawley Hospital’s Creative Arts Project, the CARTWHEELS Mobile Arts Studio has been successfully established across St John of God Mt Lawley and Geelong Hospitals in day oncology, medical oncology, mental health, palliative care, paediatric and rehabilitation units. The CARTWHEELS program will expand to St John of God Bendigo and Berwick Hospitals next year. 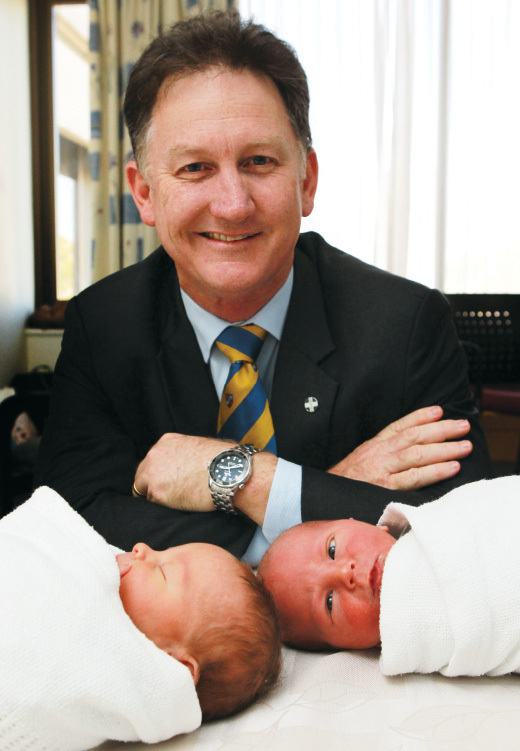 Head of Obstetrics and Gynaecology at St John of God Subiaco Hospital and President of the Federal Australian Medical Association, Dr Michael Gannon is a co-investigator on a maternal vaccine trial for respiratory syncytial virus (RSV).